This won’t be perfect, but at least it can guarantee that I’m not only displaying an id, but the right kind of id. If you think about this even further, you’ll realize that this is coming from passing object to one another, instead of just procedural “do step 1, do step 2” type thinking. One lesson I’ve learned the hard way, even when testing, is that you like to write your tests from a clean database. 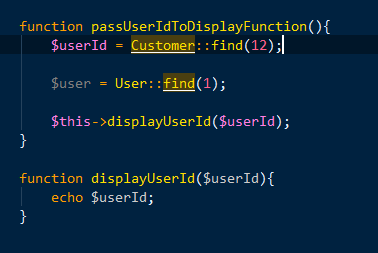 So you make a factory User whose id is 1, and a factory Customer whose id is 1, and two factory Products whose ids are 1 and 2… It is very easy to make your tests pass with the wrong values being inserted if you aren’t careful. In both this and the type hint example above, we are not just making sure that the right data type is being used, but also that it is the right right data type. Now, if the only code you ever work on is your own, written in your own way with all the proper testing and safe guards, you can probably get away without worrying about this as much. 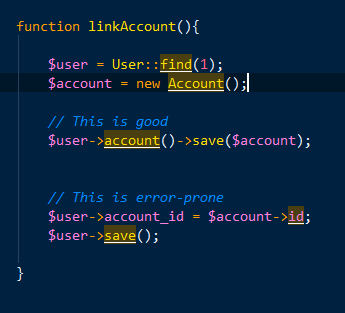 If on the other hand you tend to have to work on code that has been pre-loved by six other developers over as many years, on a team of 4 developers — each with their own naming style, and it is a bit more complicated and messy than my examples above, I would recommend doing whatever little tricks you can to help keep things working and understandable.